Eddie Gaedel's spot in the Cardinals Hall of Fame. The entertainer Max Patkin was more or less a member of the Browns' team for a while. If Bill Veeck hadn't found Max Patkin, Patkin probably would have found Veeck. Patkin was an angular, double-jointed, rubber-faced comic, who spent most of his life entertaining fans in baseball's major and minor leagues. The day Gaedel batted, Patkin wore a zero on his back and was listed in the scorecard as a coach. Patkin never met a ballpark he didn't like. Occasionally, he would actually man the first-base coaching box for the Browns. "The poor kid was scared to death," Patkin told reporters a few days after Gaedel batted, according to the Associated Press. "He had never had a bat in his hands. He didn't weigh any more than my nose. Some of the Browns frightened him. They said that Gene Bearden, who threw a knuckleball, was going to take over pitching for the Tigers." (In reality, this wouldn't have been likely, since Bearden had pitched the first game of the doubleheader, which the Browns also lost.) "They said that if Bearden got out there, Eddie should watch out -- one of those knuckleballs might hit him in the head." 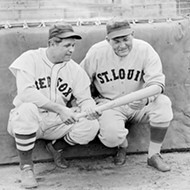 As for Frank Saucier, who was displaced so that Gaedel could pinch-hit, the event was more bittersweet than comedic. Today he's remembered solely as an asterisk, a supporting player to Gaedel's big at-bat. At the time, though, he was full of potential. A standout at Westminster College, he had had a brilliant minor-league career, including a .443 average in 1949. But Saucier played only a half-season in the majors. 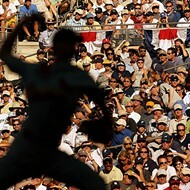 He suffered from severe bursitis in the shoulder and batted fourteen times, mostly as a pinch-hitter. He had one hit. After the 1951 season, he was called up by his Naval Reserve unit for two years. Twenty-six when he was discharged, he was too old to make a baseball comeback, and besides, he had wisely invested in Texas oil. One of his wells was pumping 150 barrels a day. The Browns hadn't been paying him much more than the major-league minimum of $5,000 a year. The St. Louis Browns Fan Club, which has been honoring former players with a luncheon or dinner every year since 1985, has unsuccessfully asked Saucier to speak several times. This year, at its dinner on September 10, attendees will receive a specially printed Frank Saucier trading card. Because of his limited career, Saucier never had a card made by any of the bubble-gum companies. Bill Rogers, president of the Browns Fan Club, said he had made one more entreaty for Saucier to attend a few years back. "Sorry," Saucier told him, "I've got some clients I have to be with then." "Frank," Rogers said, "you're 85 years old. Come on. Can't you let your clients go for a few days?" Saucier was unmoved. The fan club's dinner, on September 10, will have to once more make do without Saucier, even though his baseball card will be a featured give-away item. Rogers is taking the high road: He will mail Saucier a few cards.